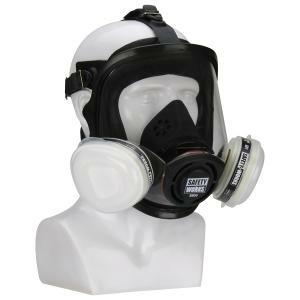 Safety WorksÆ soft, comfortable full facepiece respirator features flared back replaceable cartridges. 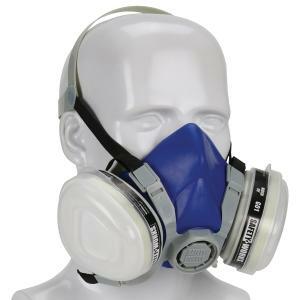 This respirator is designed for applications that have exposures that need both eye and respiratory protection. The integral nose cup protects lens fogging by directing the air flow out the maskÆs integral exhalation valve, rather than against the lens. Cartridges also fit the SWX00318 & SWX00327 respirator. Many of you who have used our odd sized measuring spoons have asked us to please get the regular size spoons of the same make. Well, WE LISTENED! These spoons were selected by Cook's Illustrated as their favorite measuring spoons. 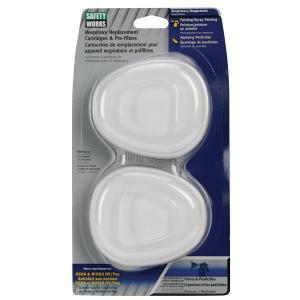 Here is a quote from Cook's...... "The sturdy Cuisipro spoons feature an elongated, oval shape that proved optimal for scooping ingredients from narrow jars. In addition, the ends of the handles curl down and thereby allowing a full measure to be set down on the counter with no tipping and no mess. Perfection is in the details." We just know you will want two pairs..... one for your pesticides and one for the kitchen! Sizes are 1/8 teaspoon;1/4 teaspoon; 1/2 teaspoon; 1 teaspoon; 1 tablespoon. Enjoy!! Yes, roses have thorns, but your fingers won't if you protect them with goatskin gloves. The only leather that is highly resistant to thorn punctures. Also great for planting and other gardening chores. Be sure to specify size. 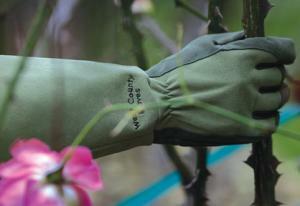 This is the glove you have seen advertised in the American Rose Magazine! Light weight, puncture-resistant , machine washable, GREAT GLOVE! Finally, a glove that fits both Men with very large hands, women with very small hands, and everything in between! Click on image for complete information and sizing guide. Treat yourself or someone you love to a pair of Felco pruners. This is the original model of FELCO pruners, unchanged for over forty years. The Felco #2 pruner is considered to be the standard by which all other pruners are compared. Solid forged metal alloy handles are complemented by a Swiss precision-made hardened cutting blade (replaceable) and an anvil blade with a sap groove. A hardened bolt and nut assure exact adjustment of both the cutting and anvil blades. A rubber cushion and shock absorber provide smooth working and soft closing of this pruner. Solid-forged metal alloy handles are complemented by a Swiss precision-made hardened, replaceable cutting blade and an anvil blade with a sap groove. Includes adjustment key. Packaged in attractive plastic package suitable for storage, with instructions for care and maintenance tips. Length 8 1/2 inches, Weight 8.5 ounces. Recommended cutting capacity is 1.0 inches. World Class. Designed for those with smaller hands who may prefer a smaller, lighter pruner. This is one incredibly well-made bypass pruner. If you're looking for the FELCO quality we love so much, but the FELCO 2 or FELCO 8 are just too big for you, get the FELCO 6. It's comfortable to use yet every bit as sturdy and powerful as any other of the FELCO pruners. This great tool is ideal for small pruning work such as grape vines, shrubs and young trees, it is also the first choice of many florists and perfect for miniature roses. The anvil blade is screw-mounted for easy replacement. The shorter blades facilitate closer cutting to the stem of the plant. Includes adjustment key. Packaged in attractive plastic package suitable for storage, with instructions for care and maintenance tips. Length 7 1/4 inches, Weight 7.5 ounces. Recommended cutting capacity is 0.8 inches. Here is a superbly designed bypass pruning shear for the professional or for those with arthritis. The FELCO 7 has a rotating handle that revolves on its axis, allowing the fingers to move naturally, reducing the blisters and hand fatigue that so often accompany prolonged pruning work. This unique swivel action requires up to thirty percent less effort than conventional models and offers maximum comfort on continuous pruning. The swiveling handle may feel strange at first, but you'll quickly come to wonder how you ever lived without it. This is the top-of-line for FELCO pruners. Both cutting and anvil blades are not riveted, so they are easy to replace and the narrow, pointed blade design allows for close pruning. Includes adjustment key. Packaged in attractive plastic package suitable for storage, with instructions for care and maintenance tips. Length 8 1/4 inches, 10.2 ounces. Recommended cutting capacity is 1.0 inches. The FELCO 8 bypass pruner is a ergonomic re-design of the original FELCO 2 pruner. This pruner is the same as the FELCO 7, but without the rotating lower handle. Light alloy handles are shaped to act as an extension of the forearm. The anvil blade handle is designed to prevent the pruner from sliding through the hand. Hollow-ground, the Swiss precision, hardened steel blade features a wire-cutting notch. The blades are set on dowel pins for easy maintenance and replacement. Includes adjustment key. Packaged in attractive plastic package suitable for storage, with instructions for care and maintenance tips. Length 8 1/4 inches Weight 8.7 ounces. Recommended cutting capacity is 1.0 inches. The FELCO 9 bypass pruner is a left-handed version of the FELCO 8, with all the same ergonomic features. Like all FELCO pruners, it features light alloy handles are shaped to act as an extension of the forearm. The anvil blade handle is designed to prevent the pruner from sliding through the hand. Hollow-ground, the Swiss precision, hardened steel blade features a wire-cutting notch. The blades are set on dowel pins for easy maintenance and replacement. Includes adjustment key. Packaged in attractive plastic package suitable for storage, with instructions for care and maintenance tips. Length 8 1/4 inches, Weight 8.7 ounces. Recommended cutting capacity is 1.0 inches. The FELCO 12 has a rotating cutting blade handle, which helps prevent or reduce blisters and muscle fatigue that results from prolonged pruning. This pruner is identical to the FELCO 6, but it has a handle similar to the FELCO 7. The top-of-the-line for FELCO pruners for smaller hands. Smaller cutting head allows for precision pruning closer to the trunk. Includes adjustment key. Packaged in attractive plastic package suitable for storage, with instructions for care and maintenance tips. Length 7 1/4 inches, Weight 9 ounces. Recommended cutting capacity is 0.8 inches. There is nothing ordinary about this patented blade design. The shape of the blade is thinner at the top and thicker at the bottom (where the teeth are). This unique feature keeps only the teeth in contact with the material being cut. Bottom line: No dragging since the sides of the blade never come in contact with the canes. Great for spring pruning large, tough canes close to the bud union. Heavy-duty grain leather with waxed thread and extra riveting for long lasting use. For belt or pocket, high-tension metal clip on back. Helps keep your FELCO pruners handy! It's time for a Pruner "tune-up". This year replace that old blade with a new one. When ordering, remember to specify your pruner model. Do yourself a favor and replace your Felco spring once each year. Each package contains 2 replacement springs. Perfect for budding plants. Extra sharp blade and a bark-lifter on top. Test your pH professionally in only 3 minutes! Click on photo for more information. A less expensive version of the famous HB-2 with the same accuracy. 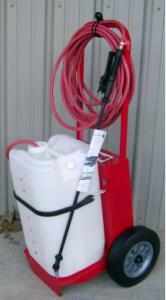 The perfect battery powered sprayer worthy of our loyal customers. We consider the Spotshot the best all-round sprayer for medium to large size gardens and for fruit orchards. High Pressure (85psi), 50 feet of hose (available in the special Rosemania version), ergonomic design and a NEW 5 gallon capacity make this the last sprayer you will ever buy. Click on the image for complete details. As with all Rosemania products, shipping is FREE to the lower 48 States! NEVER SPRAY A FUNGICIDE IN YOUR GREENHOUSE AGAIN!! Click on image for details. This 2lb bag of sulfur will last most users 9 - 12 months in their sulfur vaporizer.